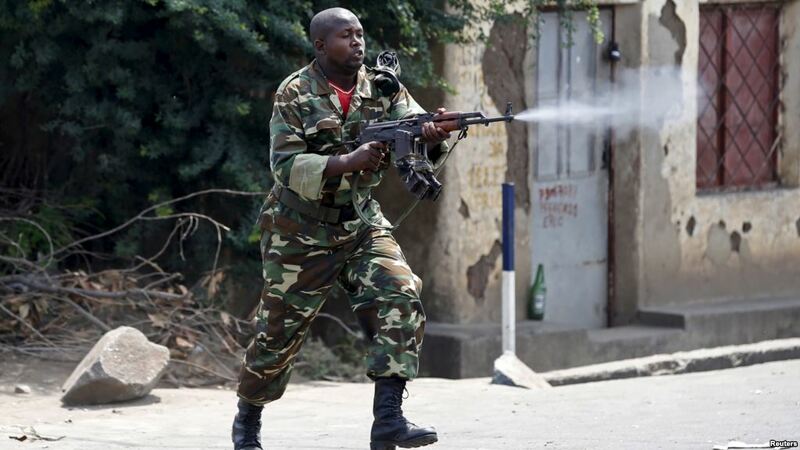 A Burundian soldier opens fire on the streets of Bujumbura in 2015. GENEVA. Burundians “at the highest level of the state” and in its security services should face trial at the International Criminal Court for crimes against humanity a UN panel investigating more than two years of human rights abuses in the central African state said on Monday September 4. The violent political crisis, sparked when President Pierre Nkurunziza announced he would run for a third term in office, has been marked by a heavy-handed crackdown by security forces on street protests. It has all but extinguished hopes that Burundi will embrace a peaceful democratic transition in the wake of a civil war that cost some 300,000 lives between 1993 and 2006. The report said rights to association, freedom of movement, as well as an independent media had been stifled: Opposition parties could not meet or act freely, their members were under constant pressure, and a large number had been arrested, tortured or killed. In April 2016, the ICC announced it had launched a “preliminary examination” of the situation in Burundi – at the time more than 430 people had reportedly been killed. On September 1, Burundi’s parliament announced it would set up its own commission, made up of 12 lawmakers, to look into the UN commission’s findings. “It’s unclear how much power and influence [FOREBU] actually wield, but an escalation of violence would likely spell trouble for Burundi and could heighten the risk of mass atrocities,” Fraser told IRIN. “Real regional pressure on the Burundian government is the preferred option, as it could prevent such renewed open violence and repression, potentially followed by a new increase in ongoing refugee flows,” he added. “Currently, Uganda, Kenya and Tanzania are putting all their eggs in the basket of mediation by former Tanzanian president Benjamin Mkapa, without really pressuring Nkurunziza to participate in it,” Van Laer said. According to Alex Fielding, a risk and crisis management consultant with 4C Strategies and a freelance analyst on African affairs, “violence hasn’t forced the government into negotiations in the past.